Naming Rituals and Indigiqueer Dreams: An Evening to Honor Our Communities. 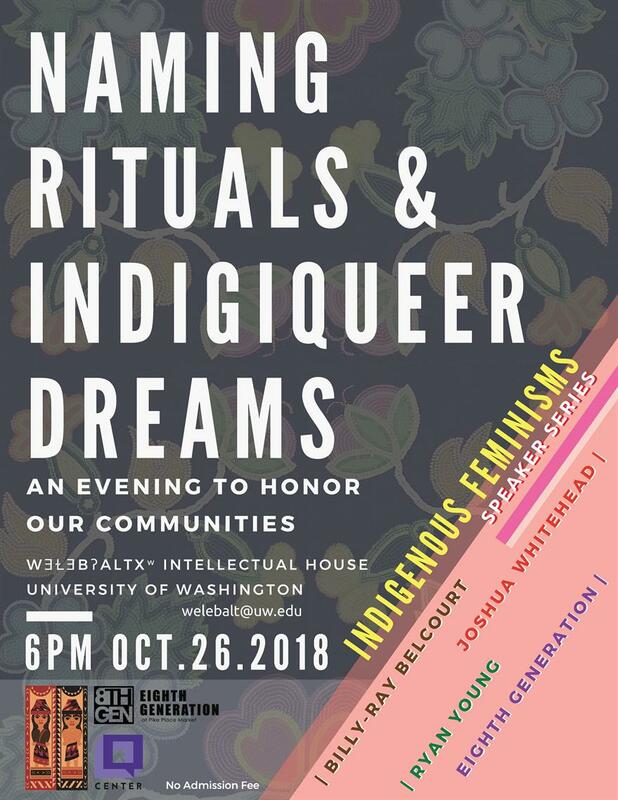 Friday, Oct. 26, 2018, 6 – 9 p.m.
LGBTQ literary giants, Billy-Ray Belcourt (Driftpile First Nation) and Joshua Whitehead (Oji-Cree) lead an evening entitled "Naming Rituals and Indigiqueer Dreams: An Evening to Honor Our Communities." Both of these stellar non-binary queer artists represent a generation of Indigenous youth who are dynamically opening the conversation wide on gender, race, sexuality, violence and caring in our communities. Billy-Ray Belcourt, a grad student at the U. of Alberta was a 2016 Rhodes Scholars. Billy-Ray won a 2019 Indspire award in the youth category, an award described as "represent[ing] the highest honour the Indigenous community bestows upon its own people." Joshua Whitehead is an Oji-Cree, Two-Spirit storyteller and academic from Peguis First Nation. Currently working toward a Ph.D. in Indigenous literatures and cultures at the University of Calgary, his poetry collection, Full-Metal Indigiqueer, was shortlisted for the 2017 Lambda Literary Award for Transgender Poetry. In 2016, his poem “mihkokwaniy” won Canada’s History Award for Aboriginal Arts and Stories (for writers aged 19–29), His debut novel, Johnny Appleseed, was published by Arsenal Pulp Press in 2018 and was long-listed for the 2019 Gilles Prize.